Acrylic emulsions offer exceptional properties like enhanced process ability, performance, and appearance to the product. Developing economies coupled with infrastructural development, growing end-use industries is boosting demand for acrylic emulsions in construction additives. Additionally, growing implementation of government regulations over emission of volatile organic compounds (VOCs) content in emulsions is a key factor driving the acrylic emulsions market. The rising popularity of polyurethane dispersions at the time of applying coating act as a restraining factor for the global acrylic emulsions market. Implementation rate is high in acrylic emulsion for preparation of several paint products combined with rising request from residential sector for premium quality decorative paints and graphic arts. These are other aspects projected to fuel growth of the global acrylic emulsions market. In addition, rising disposable income, increasing spending capacity, and growing demand for water-based paints are other factors to drive the acrylic emulsions market. A report by Transparency Market Research forecasts the global acrylic emulsions market to rise at an 8.2% CAGR during the forecast period 2017 to 2022. At this rate, the market is expected to become worth US$8792.6 mn by the end of 2022 from US5915.9 mn in 2017. The global acrylic emulsion market is segmented on the basis of products, and end use industry. Based on the application, market is segmented into acrylics, vinyl acetate polymer and others. Among these, acrylics segments are estimated to constitute the overall demand for acrylics emulsion market in forthcoming years. The acrylics’ physical properties can make suitable for a large number of customer and industrial end-use products account for the growth of this product segment. By the end of 2022, the acrylics segment is expected to hold its position and lead the year with complete growth associated to other product segments. The section is estimated at a CAGR of 8.3% in the forthcoming year to serve the demand worth US$5,533.0 mn by the end of 2022. Based on the applications, the market is classified into water-based paints, adhesives & sealants, paper/paperboard coatings and others. Geographically, the key region segments of the global market for acrylic emulsions are Europe, North America, Latin America, Asia Pacific, and the MEA. Currently, North America, powered by US accounts for a leading share in the acrylic emulsions market. Factors responsible for pushing significant growth in US market is substantial spending on high quality paints and coatings. North America is trailed by Middle East and Africa and Asia Pacific in the global acrylic emulsions market. The Asia-Pacific acrylic emulsions market is expected to rise at the highest rate in the upcoming years, in terms of volume and value. Expanding economic growth, developing production industries, rise in foreign investments, accessibility of cheap labor, and rise in the applications will boost the market. These major factors of acrylic emulsions across paints & coatings applications are some of the key aspects expected to drive the market. 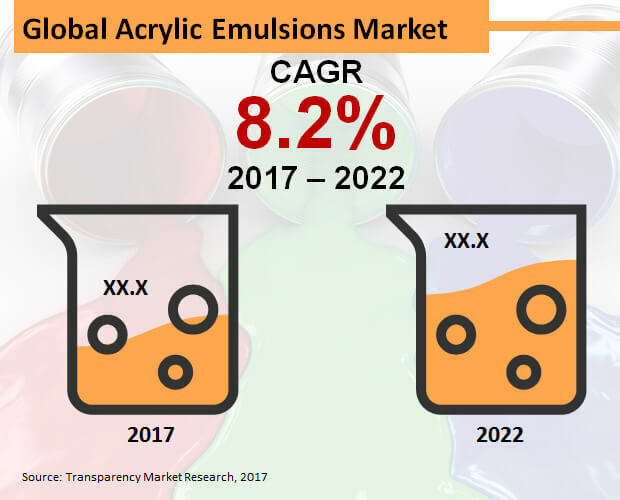 Rising demand in developing economies like China, India, Indonesia, and Malaysia are projected to boost the acrylic emulsions market in the Asia-Pacific region. The market study on the global acrylic emulsions market is a 360 degree overview of growth trends, product developments, and competitive strategies of the said market for the 2017-2022 forecast period. The report also examines market drivers, challenges, and opportunities that are expected to have a bearing on the market over the aforementioned forecast period. The report also covers a discussion on value chain analysis and examines factors that will impact the market dynamics over the forecast period. The market analysis is based on outcomes of primary research and secondary research, and insightful inputs received from industry experts. Economic index and GDP have also been considered for presenting market projections for the acrylic emulsions market between 2017 and 2022. The global acrylic emulsions market is benefiting from rising disposable incomes leading individuals to spend substantially on high quality decorative paints. Apart from this, the recovery of the construction sector leading to building of residential complexes, commercial buildings is also boosting the acrylic emulsions market for paints and coatings. In developing economies, rapid industrialization and urbanization is also stoking the demand for acrylic emulsions for adhesives and sealants. Industrial units display a substantially high demand for materials such as adhesives and sealants to prevent leakages. Residential complexes and housing units also display a substantially high demand for adhesives and sealants to seal pipes, cables that pose a risk of accident. The growth of the paints and coatings industry is indirectly benefiting the acrylic emulsions market. Paints and coatings display a substantially high demand for acrylic emulsions to improve the product quality. The global acrylic emulsions market could witness a segmentation depending upon product type, application, and region. By product type, there could be several opportunities taking shape in the global acrylic emulsions market. The prominent segments such as acrylics, vinyl acetate polymer, and others could be crucial for the growth of the market. According to segmentation by application, the global acrylic emulsions market is anticipated to look up to water-based paints, adhesives and sealants, paper/paperboard coatings, and others for a rise in demand. If the geographical segmentation of the global acrylic emulsions market is concerned, Asia Pacific except Japan is expected to hold supremacy in terms of revenue in 2017. The region is expected to contribute 34.1% revenue share to the global market in 2017. Going ahead, the region is expected to display a healthy 8.8% CAGR between 2017 and 2022 to retain its lead position. North America is an attractive market for acrylic emulsion on the back of excessive industrialization and urbanization that are stoking demand for paints and coatings and adhesives and sealants. This section of the report covers detailed competitive profile of leading players in the global acrylic emulsions market. The leading companies in this market include Arkema S.A., BASF SE, Clariant, DIC Corporation, H.B. Fuller, Synthomer Plc., Ashland Inc., Celanese Corporation, DIC Corporation, The Lubrizol Corporation, and The Dow Chemical Company. Following this, the report covers competitive strategies of key players along with insights into their business positioning, financials, and SWOTs. Lastly, key players are profiled based on parameters of key competitors, employee strength, business overview, and recent product developments.